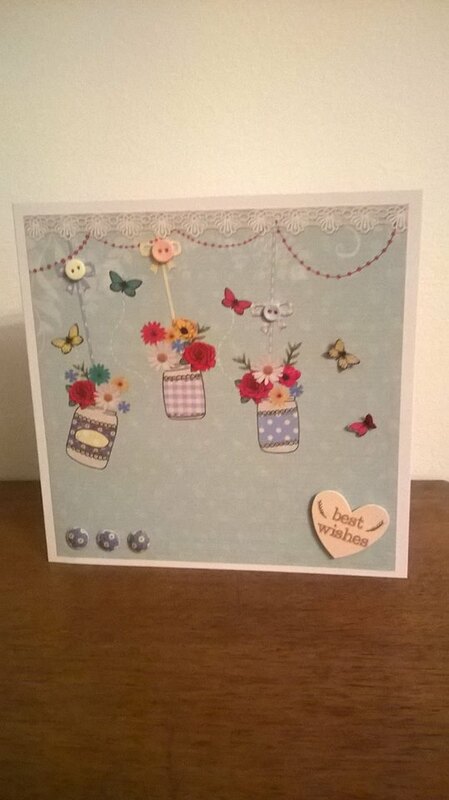 It's been a busy week working with a brand new kit, Craftwork cards Bohemian dreams, WOW it's awesome, bright, happy and full of life. 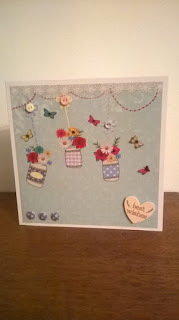 If like me you're afraid of using a lot of colour in your crafting it may feel a little intimidating at first but believe me 2 cards in I was in full swing, inspiration following and there was no stopping me. 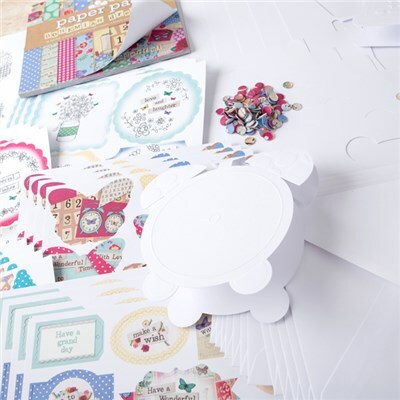 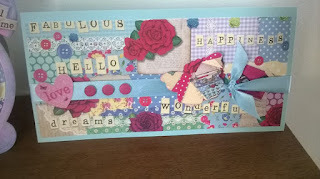 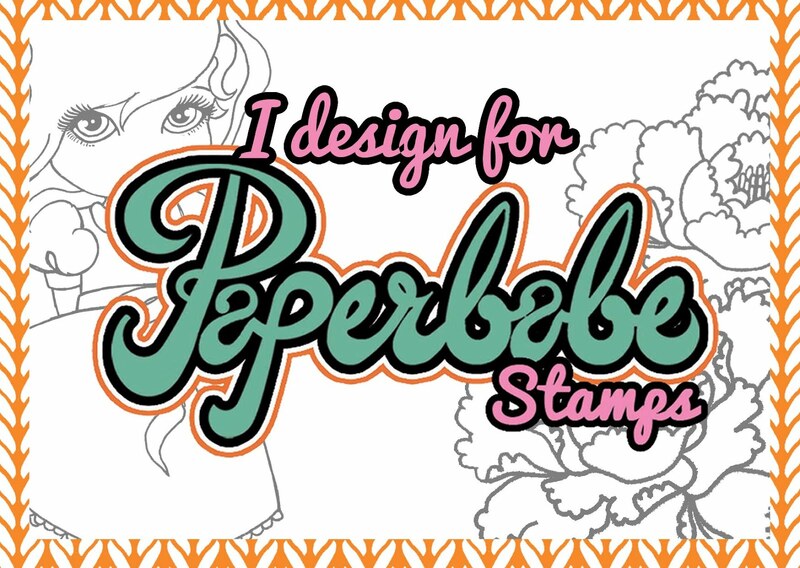 Here's what came in the kit, paper pack, shaped cards, toppers, butterfly, candi and sentiments. 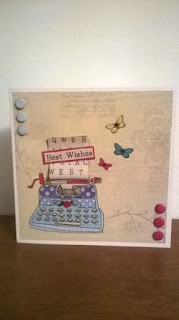 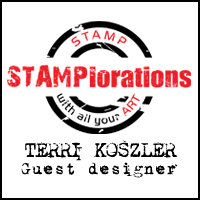 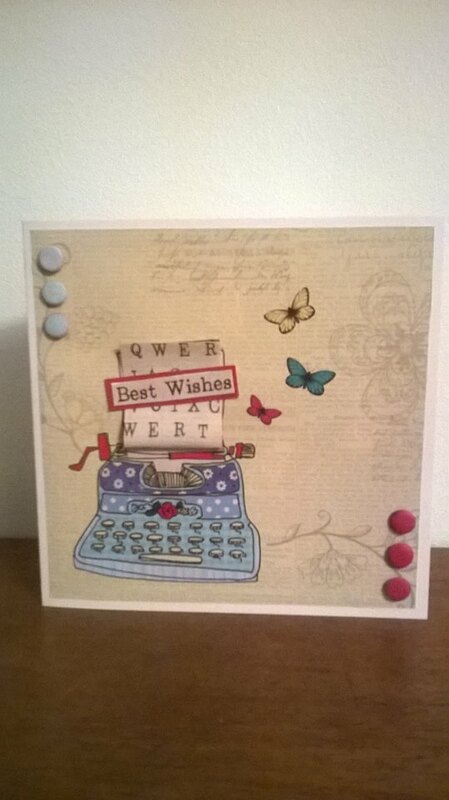 This card was made with one sheet of paper fro the kit, candi, a topper and then I added 3 mini buttons for some added die-mention. 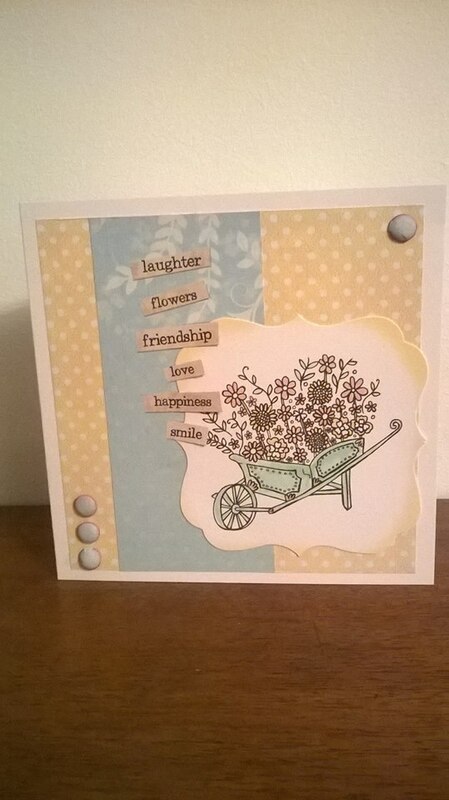 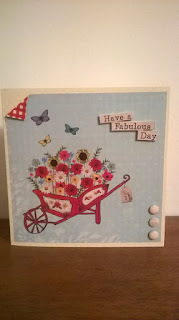 This was the first of the toppers I used, it came with a slight colour to the edges but the image was black and white, I used 3 pastel promarkers to shade the flowers and wheelbarrow giving the card a muted look. 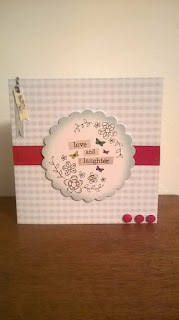 For this card I used one of the sheets of paper for the background and then cut the sentiment from another sheet and mounted it on foam pads, added candi and folded a corner over to reveal the bright reverse of the paper. 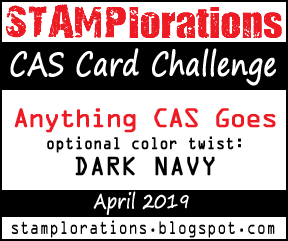 This was a quick topper, background paper, strip of bright paper and candi, a super fast card for those times when your in a pickle. 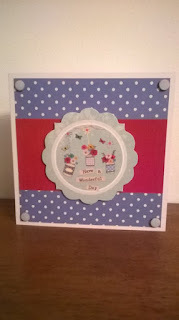 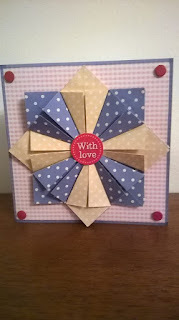 This card was made by my daughter, I love it, the pink band across the center is 2 off cut that sit just behind the topper giving the impression of a ribbon,a fab way to use up small pieces. 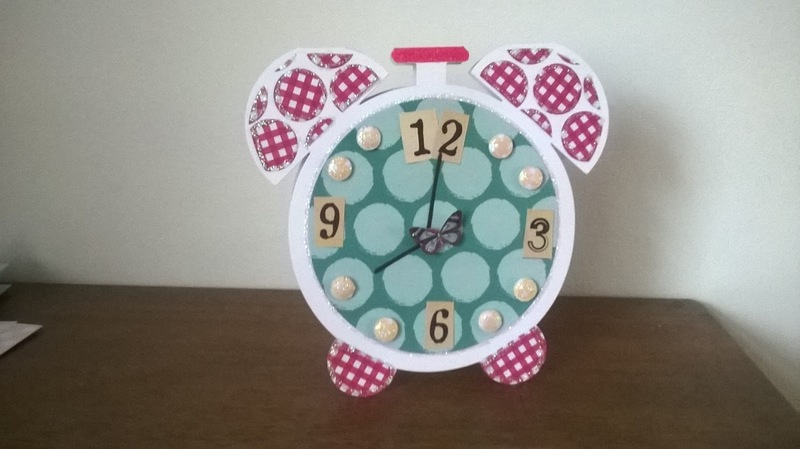 Now this really pushed my crafting boundaries as it's so bright and busy but I think I can just about live with it, what do you think? 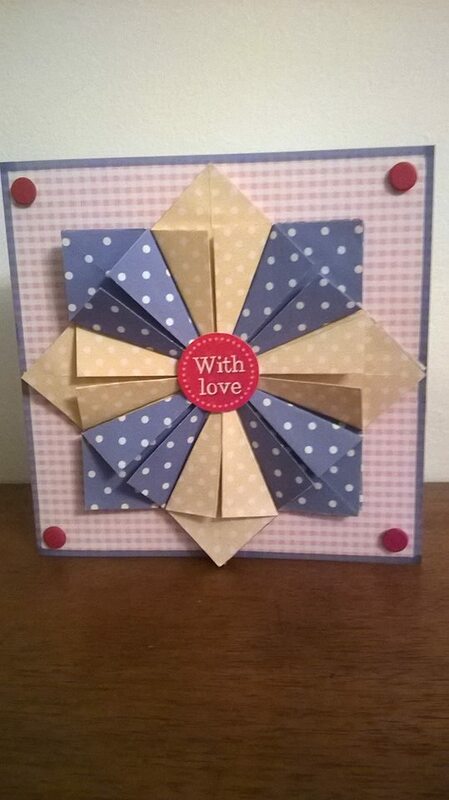 Me and my daughter had fun with this next card, paper folding the main element and then placing it on one of the card form the seaside summer kit and edging with a Promarker in China blue. 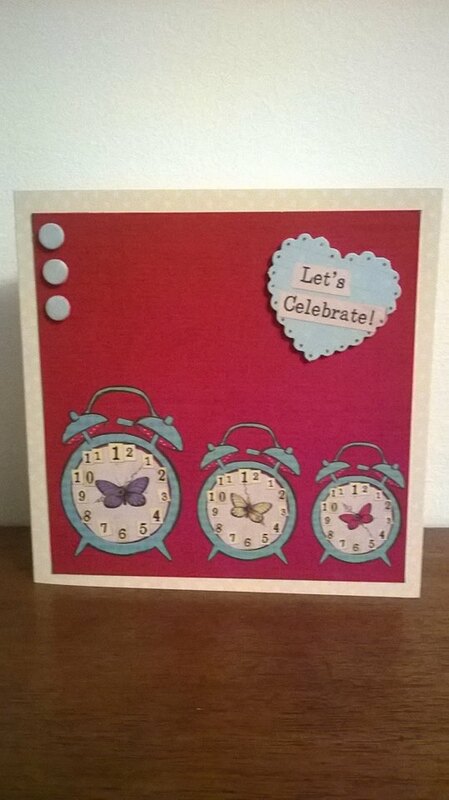 This is one of my favorite cards so far, the alarm clock card blank came with the kit as did the main topper. 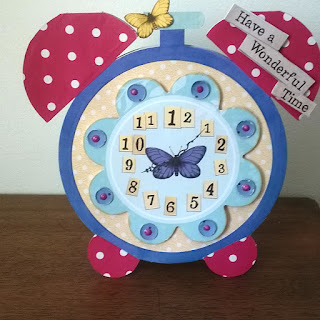 I used the candi placed upside down and added a liquid pearls drop into each, I used a sentiment and butterfly form one of the backing papers and used some of my off cuts from the kit to cover the bells and feet of the clock. For this card I die some die cutting for the clock handles and spots on the bells, I added glitter glue in a few places to make things sparkle, think I may go back to it and add a bow and a sentiment, what do you think?